Available In Natural, Black and Mahogany Colors! Bamboo fencing is a decorative and environmentally friendly alternative to chain link fencing or wood fencing and can last up to 10 years in drier climates. Today, it's one of the most popular and affordable options in decorative fencing. Its natural elegance adds privacy and security, as well as a unique look to a rich green garden. This attractive and durable material is well known for its warmth and beauty, but also for its convenience and ease of use. We use galvanized steel coated wire in rows which is run through the center of bamboo poles to attach bamboo poles tightly together this method is used on rolled fence only. 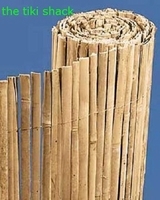 Bamboo fencing material can be rolled and split. When putting the finishing touches on your yard and landscaping projects, a common dilemma is what kind of fencing designs to use. One of the simplest, most time saving ways to have a bamboo fence installed is with the use of Bamboo Fencing Panels. As the name implies, they are pre-made panels of quality bamboo fencing that are ready to be installed. Consider what purpose your bamboo fence will serve in your yard. Is it for privacy, or more of a decorative bamboo edging? Will it be used to contain a garden, or to provide a look and feel of the tropics? To provide you with some direction and to inspire ideas, please look at some of our other pictures on the website for some designs to beautify your home and garden. Bamboo Fencing Panels are versatile in that they can be installed quickly and can be left up permanently or temporarily, depending on their function and purpose. Also, ours will bend to form to just about any project you desire! But Increasing its Curb Appeal and Value is Easy with Bamboo Fencing! Our affordable rolled and split bamboo is an easy way to do this while allowing you to focus your time and attention on other things. It is very easy to install with a staple gun or wood screws or your fencing contractor will install your Bamboo Fencing Panels and have your yard and garden looking the very best that it can while adding beauty and style to your home. Disclaimer: Bamboo poles in the fence are not always straight and grow tapered so one end will be smaller that the other end. Sizes are approximate and are measured at the widest end, They come from a very moist climate and will crack in hot climates, sometimes in transit. Bamboo can have color variations. Please consider before buying. To help protect the bamboo from fading or discoloring using a polyurethane varnish with multiple coats will work wonders. *** FREE SHIPPING NATIONWIDE *** → Prices Below Include Free Shipping to your Door! → All bamboo fence will ships out in 3 business days! You can find amazing discounts on bamboo fence rolls online. Some of these deals even come with fast and efficient shipping right to your door. 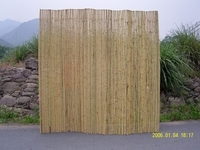 You can purchase bamboo fence rolls in a variety of sizes and lengths. Some of the most popular dimensions include the following. There are many wholesale purchasing options for bamboo fencing, as well. If you find that the sizes above don�t suit your needs you can easily trim and customize bamboo fencing to meet your project needs. Bamboo is one of the most affordable fencing options, as well, especially considering its longevity, durability, and eco-friendly characteristics. Bamboo fencing rolls are aesthetically pleasing, widely available, and easy to install, making them the perfect combination of form, function, and value. Bamboo fencing is very effective when used as a border for your garden or yard. It adds a unique Zen-like appearance to any garden space or backyard, showcasing an elegant look and feel that can be made contemporary or rustic, depending on the style you choose. You can even choose shorter garden fence rolls to partition your vegetable garden if you don�t like the taller versions. However, taller bamboo fencing rolls are excellent for flower beds and vegetables that grow on a climbing vine. If you have fountains, ponds, or a pool, bamboo fencing can be used to edge or line these areas, as well. Another option is to use beautiful bamboo fencing to cordon off less-than-pleasing areas of the yard such as your propane tank, garbage disposal space, or air conditioner. The possibilities for using bamboo fencing are virtually endless. One of the main benefits of bamboo fencing is that it�s eco-friendly. Bamboo is a renewable resource that has a growth rate of three to five feet per day, so it only takes about three years for a harvest of bamboo to replenish. Comparing that to the 30 to 50 years it takes for a tree to grow back it�s obvious that bamboo is the more ecologically responsible choice. Additionally, the harvesting process doesn�t contribute much waste, which can�t be said for logging. Given that it�s such a versatile material and doesn�t require many chemicals in order to thrive it�s clear that the environmental benefits of choosing bamboo are vast. These benefits make it a much better choice than timber, but it�s also better than timber because it�s so lightweight. Timber is very heavy and requires high transportation, shipping, and processing costs. However, bamboo is very light, so it requires far fewer resources from harvest to product manufacturing resulting in lower costs for you. There are many benefits in store for those who choose to use bamboo fencing. If you�re looking for a strong, stylish alternative to wood fencing, bamboo is already a clear winner. However, the benefits of bamboo fencing extend beyond its durability and aesthetic appeal. The limitless color options, style varieties available, and easy installation process make it the perfect choice for virtually any fencing project. Additionally, bamboo is low-maintenance and rot-resistant, so you won�t have to continually upgrade or replace it like you would with timber products. There is a wide range of styles and colors available for those who want to give bamboo fencing a try. Natural Bamboo Fencing - Natural bamboo fencing can be used to add a unique and organic look to your backyard landscaping. These rolls come in a natural, light tan color and come in many different sizes. You can tie these fencing panels together or place them inside frames for easy installation. Carbonized Bamboo Fencing - Carbonized bamboo fencing allows you to transform your space into a backyard oasis. The rich carbonized color provides a more modern and contemporary look to your home and garden space. 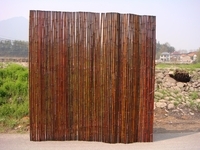 Mahogany Bamboo Fencing - For a more modern look, you can choose mahogany bamboo fencing. These dark vibrant mahogany color panels are easy to install and come in a variety of sizes. Unlike natural bamboo fencing, Mahogany bamboo fencing is dyed and will look great indoors or outdoors in the natural sunlight. Black Bamboo Fencing - The pure dark color of black bamboo fencing contrasts beautifully against vegetation and flowers. Black bamboo fencing can also be used to cover up a dull chain link fence. This style of fencing is weatherproof, easy to install and comes in a variety of sizes. You can even mix some black bamboo fence panels with some natural bamboo fencing for an artistic look. Tigerboo Bamboo Fencing - Also known as natural burnt bamboo or tiger stripe bamboo tigerboo bamboo fencing offers a natural look with dark striped patterns and spots. 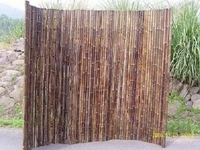 This look is perfect for an indoor or outdoor tiki bar or can be used as fencing to surround the home or garden. Bamboo fencing poles aren�t always perfectly straight, and since they originate from moist climates they tend to crack in hot weather. Additionally, bamboo�s color will naturally fade over time. You can help protect your bamboo fencing from fading using a polyurethane varnish in layered coats. When bamboo cracks, however, it doesn�t reduce the structural integrity of the material and even adds a natural, rustic charm. Some homeowners prefer the cracked look.